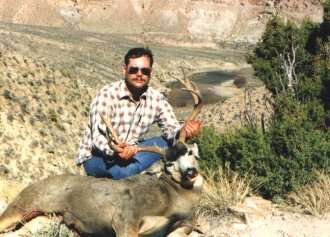 This buck was taken on the Big Rio Ranch, near Craig Colorado. He's a four pointer, 24" wide. That canyon behind me was his home, near the bottom of course. Four pack trips up the steep canyon brought him out for the last time. 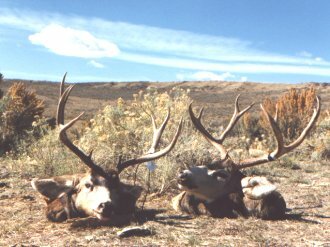 Bob Brancati shared the pack duty, before taking his own buck. A custom Mauser 98, chamered for .338 Winchester Magnum, tossing a 250 grain Sierra did the trick. 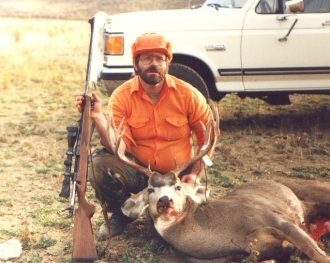 This is Bob's buck, taken the next morning. Also a four pointer, he was taken at daybreak. A single shot thru the lungs dropped him cleanly. That's a Remington 700 in 8mm Magnum. Bob was wise enough to shoot his where we could drive to it. That's my Ford Buck-mobile in the background.